Perhaps it is my new "Bigger is Better" Texas mentality that draws me to oversized clocks. Actually, truth be told, I fell in love with oversized clocks years ago when I interviewed Brooke GIannetti of Velvet & Linen. This was before the Patina Farm days when she lived in an enchanting beach bungalow in Santa Monica. Brooke hung an oversized clock in the staircase that led to her second floor. I thought it was an interesting piece and loved the unconventional placement. I was hooked! ​Since that time, oversized clocks have become pervasive in the design world. Let's see more! These clocks can work well in a multitude of spaces. 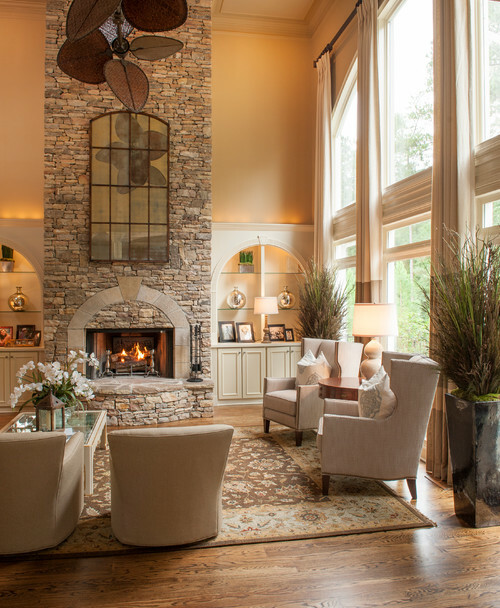 Big and small walls, traditional and industrial settings, interior or exterior spaces can all make room for an oversized clock. ​Look at this beauty above in a courtyard. The clock almost looks like a piece of art. Love it! The kitchen and dining space above are cavernous. I love the way one BIG clock anchors the kitchen and gives it some dimension with the black border and crisp black roman numerals. With lots of white and cream in the adjoining rooms the space needed a punch. As I am sure most in the blogosphere well know, oversized clocks are EVERYWHERE. Wayfair, HomeClick and Hayneedle all carry a large selection of wall clocks. In addition, Etsy has some custom options. ​My inspiration started long before Fixer Upper hit the airwaves. This photo of Brooke and Steve Giannetti's home was done almost a decade ago. Brooke captioned the shot "Time for bed". The Yosemite Home Decor Circular Wall Clock is the perfect solution for bargain hunters. For under $125.00 you can fill up a wall with this 48" beauty! This clock is a lot of fun. You can pick various sizes and even have a custom name put on the clock. What a cool housewarming gift! Sizes range from 10" to 60" (wow!) and can be personalized with a name and year. The photo above gives you an idea of the size! I hope these images provided you with some timely design inspiration. Time to end this blog. Ha! Couldn't resist. Happy shopping! ​To be honest, I never really gravitated toward mirrors for literal self-reflection. The real reason...for most of my life I have been cursed with homes that had 8ft ceilings. Grrr! Mirrors have always been a way for me to bring light into an otherwise dark space. 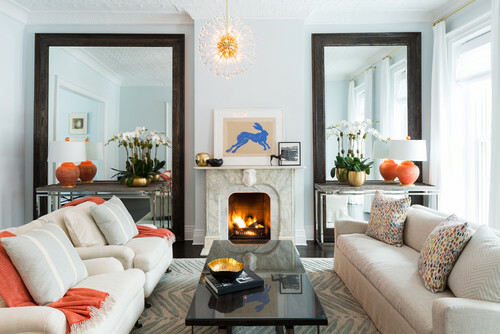 Mirrors are also an ideal way to fill up a wall without having to spend a fortune on art. With the endless amount of options that exist, mirrors are one of my go-to wall decor options. Big, small, round, square, rectangular and more... You name it there is a mirror that will fit your space and budget. A unique mirror shouldn't be saved for just the living or dining room. 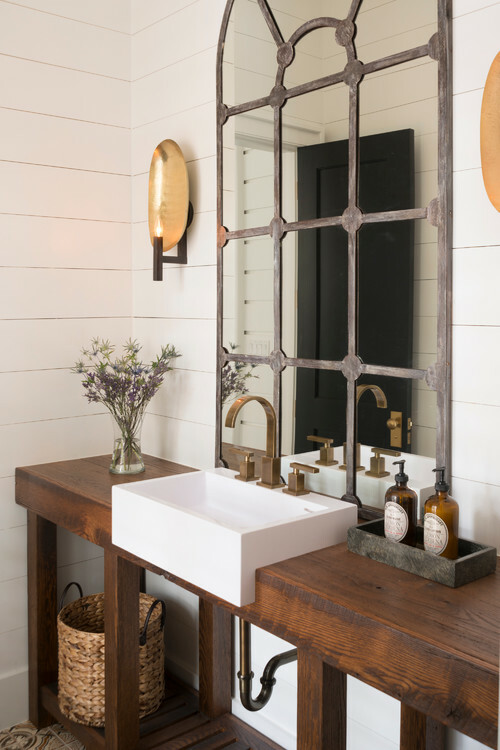 I like unexpected mirror options in more traditional spaces such as a bathroom. The image above shows a Drake French Country Rosette mirror that I LOVE! That isn't exactly your typical powder room mirror. With so many options that exist, it is fun to play with mirrors from a design perspective. You can sometimes give a room an entirely different personality just by adding a well placed, appropriately sized mirror. Here are some of my favorites. These leaner mirrors have been tucked behind console tables. They create height and depth in the space. They also bring in tons of light!